Originally developed by NASA as a versatile material for astronauts, memory foam has made its way into bedrooms all across the country. Memory foam is frequently one of the most expensive options available to bed buyers, but its benefits for those with back pain may be worth the extra money. Memory foam mattresses are known for their ability to conform to the body. When you lay down, the memory foam softens, bends and relaxes to support every part of your body including your spine. Fully supporting the spine keeps it in proper alignment, relieving back pain issues resulting from poor alignment during sleep. Memory foam also keeps the rest of your body in alignment, reducing stress on your hips and shoulders that may lead to back pain. The visco-elastic nature of memory foam mattresses allows them to conform to any pressure points on your body. Memory foam reacts to the warmth of your body to become softer and more conforming. Pressure points are small surface areas which handle a large proportion of body weight. Traditional pressure points include the hips, shoulders and knees. Memory foam helps cradle these pressure points, which provides additional comfort for your back. Back injuries require adequate rest to heal. The body heals most efficiently when sleeping and as a result, an uninterrupted night of sleep is vitally important to healing back injuries. Memory foam mattresses offer several qualities that increase comfort. They are temperature sensitive, dissipating or absorbing heat as needed to keep the mattress at a comfortable temperature. They are hypo-allergenic which benefits those who suffer from allergies while sleeping. Finally, because they absorb energy and pressure so well, the movements and shifting motions of others will not wake you up, allowing for more restful sleep. Consider using a standard mattress with a memory foam topper. Most bed and bath stores will carry simple, thin memory foam mattresses that you place on top of your mattress. 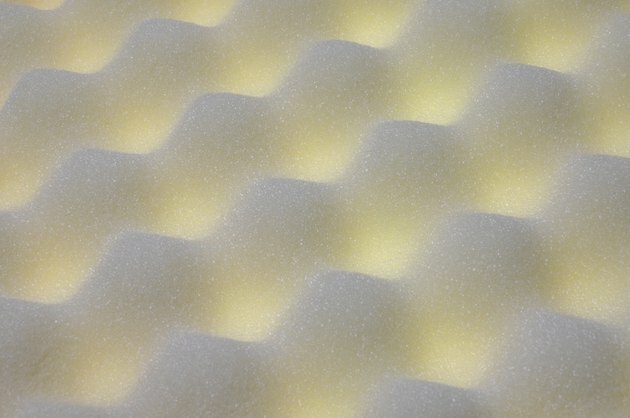 Memory foam toppers come in sizes from 1 to 5 inches thick. Memory foam toppers are also more affordable than full memory foam mattresses yet still provide many of the same health benefits. They are available in the same sizes of standard mattresses including twin, double, queen and king. Memory foam is not just found in mattresses, but pillows as well. Memory foam pillows are a significant change from the soft feather pillows most people are used to. However, the firm memory foam pillows may provide additional neck support that many people need for a good night's rest. For those who have neck soreness after sleeping or difficulty with sleep apnea, a memory foam pillow may help to elevate the head and support the neck. What Are the Causes of Back Pain After Sleeping?